I am an experienced Martial Arts instructor, focusing primarily on self-defense tactics and energy work. This combination provides students with the skills needed to avoid dangerous situations and effectively ward off attacks. I teach proven techniques derived from three different martial arts forms, using skill over strength, and requiring no prior training. Although the combative methods are highly stressed, the number one goal is to change the student’s demeanor and attitude to ensure they are never considered a target. I believe that providing this training is a benefit to society as a whole. I actively promote the idea of moving Martial Arts away from its current connection to capitalistic gains, and bring it back to its origins; a method of creating a community of safety and integrity. I plan to accomplish this by establishing non-profit clubs, managed by dedicated educators, with a goal of providing these skills to anyone who has the desire to learn. Instructor-Level Training through Hewlett-Packard Co. I started studying Judo at the age of 12, and continued training for over 10 years. Judo was a great starting point as it teaches body mechanics, leverage, and basic self-defense principles. Five years later, as I was exploring other art forms, I befriended an Aikido Master and a group of us started the Lockheed Aikido Club. Aikido is an extremely advanced form of self-defense, taught in a very "soft", non-aggressive, style. Unlike most of the martial arts, Aikido techniques are totally defensive and focus on simply redirecting an attacker's energy, eliminating the threat. As a member of both the Judo and Aikido clubs, I was given the opportunity to receive additional training under Professor Tamura, a Seventh Degree Black Belt highly respected in the martial arts community. After studying self-defense forms for many years, I started my training in an offensive art, Tae Kwon Do. Although most forms of Tae Kwon Do are currently taught as a sport, I was fortunate to work under Mr. Ui Jung Kim, a Sixth Degree Black Belt who was still teaching the Han Moo fighting art, and a small group of us started the Lockheed Tae Kwon Do club. 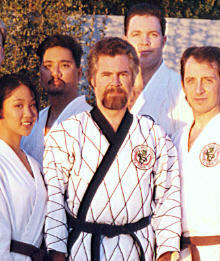 After 40 years of training, I’ve taken on the legacy of keeping this form alive by teaching at several clubs, managing a large group at Lockheed Martin, and serving on the Board Of Directors of the Han Moo Kwan Tae Kwon Do Association. In addition to my experience in martial arts, my professional career at Hewlett-Packard Co. has included several teaching positions. Required training I attended to enhance my training/presentation skills included courses on class-management, course-development, presentation, and accelerated-learning techniques. I’ve taught classes in application development, system management, and effective presentation techniques. I have given lectures at technical conferences, demonstrated PC products for the CEO of Hewlett-Packard and Safeway Corp., promoted new PC designs on Swedish national television, and presented computer-graphics techniques to Her Majesty Queen Elizabeth II and His Highness Prince Phillip.